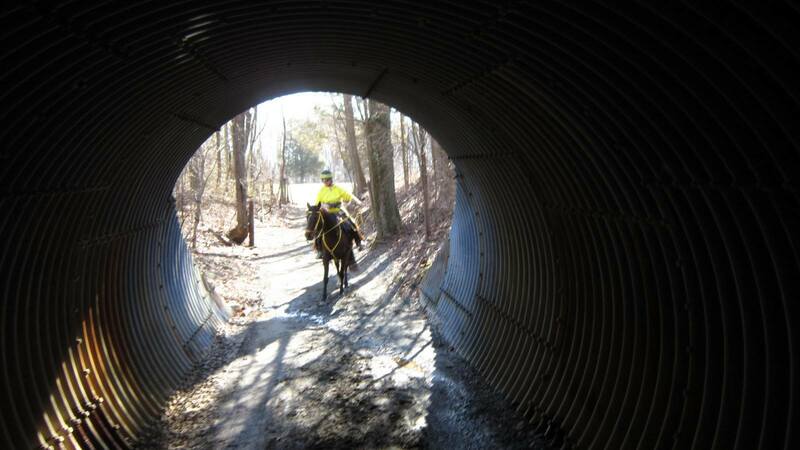 Mentally I am *READY* to go do the first ride of the 2014 season. Physically? Oh my am I gonna suffer. 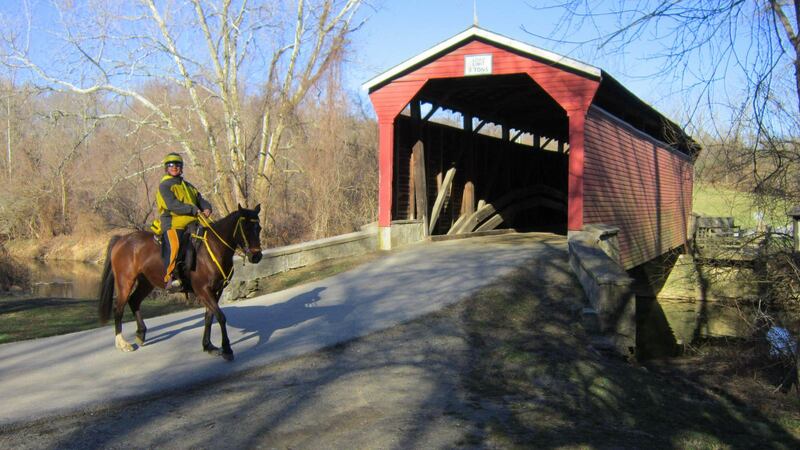 I have not ridden consistently this entire winter due to snow – ice – more snow – even more ice – and then just as the weather started to break we had rain – mud – more rain and then I got the flu (first time in my life I ever had the flu) and it knocked me back two weeks. From all the coughing, now my back has been giving me some trouble. So why am I excited? Because I just don’t care, I’m going to go ride 25 miles and kill myself. It’s all good. Sherry was unable to come along with us to the Chesapeake Spring CTR and ride Steel due to her back being twingy. I told her “I TOTALLY GET IT” and reminded her to take care of her back while she’s young because she never (ever) wants to have back troubles like I do. It was probably the Powers That Be taking control because truthfully, Steel only has front boots and I don’t think she would have completed this ride being barefooted behind, so it all worked out exactly the way it was supposed to for Sherry and Steel. BEFORE I START THIS STORY … A HUGE THANKS A MILLION to Cate, Denise, Ben and all the volunteers that made this ride possible. After spending all last year on the ground as a volunteer, while other people rode my horse, I will always remember the hard work and dedication it takes to put on a ride. THANK YOU THANK YOU!!!! So, I start the morning at 2:00 am … REALLY??? I didn’t MEAN to get up so early. My husband’s alarm clock is an older model with built in “Daylight Savings Time” change over. Well, it was built in before the Daylight Savings was changed from the first weekend in April to the weekend in March. So, you know what happened? At 2:00 am, it changed over to 3:00 am in anticipation of Daylight Savings and started ringing to tell me it was 3:00 and I needed to get up. I jumped out of bed, excited to get going and ran downstairs in anticipation of hot coffee waiting for me. You see, I had set up the pot the night before to start brewing at 2:45 am so it would be ready for me. Uhm … the coffie is not brewing. What the ?!?!?!? I look at the microwave and the clock says 2:07 am. Frackin’ alarm clock (sigh) now I’m awake and there is no way I’ll be going back to sleep now. I turn the coffee pot on and sit down to wait. Rest of the day went well despite the rough start! Remarkably, when I got to the barn to get Miss Daizy ready, she came right up to me to be caught. Good thing because we do not have electric in the barn right now due to an underground short in the wiring and I had to shine my truck headlights into the paddock to see her. I groomed all the caked on mud off her while she ate her breakfast and before I even got started for the day, I was filthy. The drive to the ride was uneventful. Cheryl picked me and Miss Daizy up at my barn at 4:30 am. As I have very little gear to stuff into her trailer, we were loaded and on the road by 4:45 am. We giggled and talked all the way to the ride and didn’t miss a single turn. REMARKABLE! We arrived at 6:30 am and quickly got checked in and vetted in. Horses were shedding so badly that it was very difficult to get the crayons to mark their numbers. My number was 55. When I saw that on my ride packet, I thought (for some reason or another) they were putting our age on the ride packets. When I saw Cheryl’s ride packet, I quickly got over being a bubblehead and realized it was our horse and rider number. It was CHILLY when we arrived so I had on a coat, hoodie and t-shirt plus gloves when we were standing around for the ride meeting. As always, Cate ran a tight ride and the meeting was to the point. 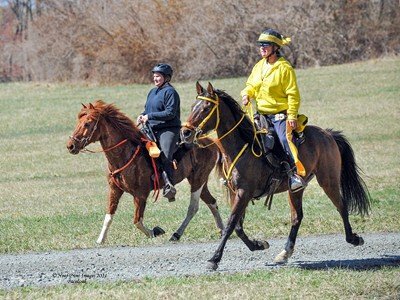 One thing she stressed on three separate occasions during the meeting was that the course was going to be on the paths, which is gravel roadway, so if our horses are barefooted, PUT ON BOOTS. This made Cheryl a little nervous for Sooner because she only boots his front feet. We were the third group out at 8:02 am … ride meeting was finished at 7:44 am and that gave us less than 18 minutes to get tacked up and warmed up to get out on trail. I had kept Miss Daizy’s saddle pad in the house over night so the foam inserts would be soft but apparently is was cold enough during our drive down to harden them back up. OH SO SORRY! I had to put that hard pad in her and get on to ride right away. Man, that made me feel badly for her. I barely had her bridle on when I heard the timer call our numbers (Me, Cheryl and Susan) to get on deck. That is a two minute warning. I hopped on Miss Daizy and ran over to the timer to check in. I hollered to Cheryl to hurry it up. Now, there’s a switch, she’s usually always waiting on me. Susan’s little Paso Fino was barefooted and she asked about the trail, was told it was gravely roads, and she left to put boots on him. She told me to leave without her. Wow, time to go out and it’s just me and Cheryl. Miss Daizy and Sooner, doing the first loop together. Off we go. I swear, Miss Daizy knows when it’s a competition because she left out of the hold moving along at a great pace. I didn’t have time to stretch out my back and hamstrings so I’m all tight riding like a scared greenhorn with my toes down, shoulders up and stiff as a board. 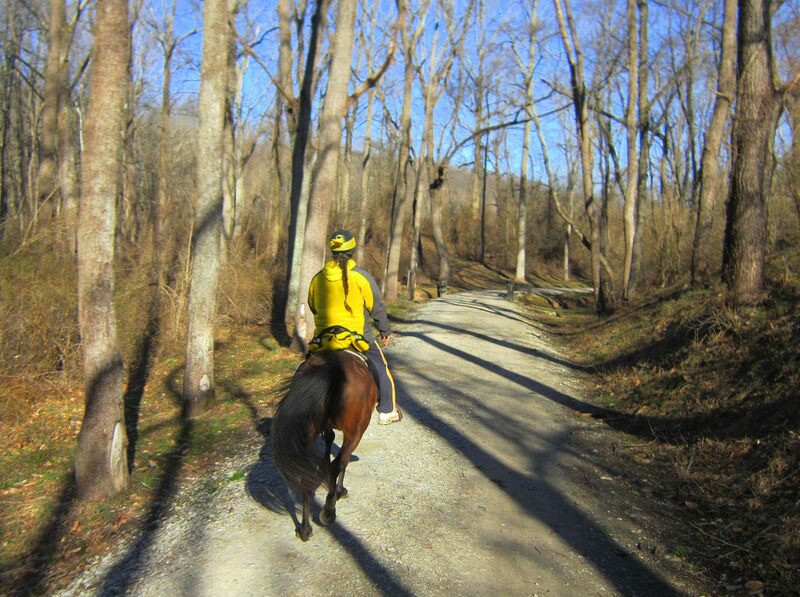 Gravel service roads at Fairhill. Remarkably, my body quickly relaxed by mile #3 and I was able to ride properly. Whew. I knew it was mile #3 because we hit the gravely roads just about the time that my body settled into a riding rhythm with Miss Daizy. Cheryl took one look at what we were about to ride on and she started getting worried for Sooner’s back feet. We hit that road and Miss Daizy was READY to rock-n-roll. She started into her “I might be short but I have very very long legs” trot and we left Sooner behind. I slowed her down and waited for him to catch up. Then we got out front again so had to slow down and wait. Miss Daizy has a wonderful farrier, Renee, and although I am a supporter of barefooted horses competing, Miss Daizy came to me with shoes on and I have been hesitant to change that because it works for her. She has the most excellent feet and would probabl make a great barefooted horse, but today on this competition, I was very thankful for her set of shoes. This went on (rush ahead, slow down and wait) until we reached mile #7 and Sooner could get off the gravel roads onto the grassy burm. THEN, Sooner got his second wind and took over the lead. We cranked out that first loop so fast that we had plenty of time to stop and take lots of pictures. Although Cheryl was very concerned for this gravely road riding, we only had about 3 miles of it where we could not get off onto the soft edge. I thought Sooner was doing terrifically well on the gravel and I told Cheryl that he was doing fine. She thought for the second loop she would see if she had a set of boots to fit his back feet so she wouldn’t worry too much. Here’s a couple pretty pictures Cheryl took while we were cruising along the first loop. I got really warm (like sweaty warm) about halfway through the first loop and she took a picture of me disrobing layer #1. Coming into the halfway hold, we were thinking to just walk in the last mile. We had PLENTY of time because we really cranked out the first loop. Unfortunately, a group of riders came up behind us and they didn’t have the same mental process as we did about walking. Miss Daizy and Sooner got caught up in the excitement of those horses passing us and we trotted in to the hold. I was a little disappointed because I wanted Miss Daizy to have a good heart rate at the hold, but it is what it is. Amazingly, even though we trotted in to the hold, at our ten minutes her heart rate was 44 and her respiration was 12. That was impressive. Especially considering that our conditioning through out the horrible winter was pretty non-existent. She is a “self exerciser-horse” as she spends all day trotting all over the field trying to get the other horses to play with her, or chasing them away from something she thinks is hers … so while I’m out of shape, apparently she is not! Cheryl is concerned for Sooner because although he got A’s on everything, his heart rate is up and was just at the minimum requirement to continue. I told her not to worry about it because (1) we trotted into the hold and (2) they got excited when that group of horses passed us and (3) this is his first competition so he’s probably got some adrenaline going on. She wasn’t going to go back out on the second loop because of the gravel roads, but I convinced her to put back boots on him and just “GO!” because if he doesn’t start doing longer mileage, he’s never going to learn how to do longer mileage. She agreed and at 20 minutes, we were back out on the trail for loop number two. Well, I got the surprise of my life on the second loop. Miss Diazy was “ON” … she was totally cranked and ready to rock-n-roll. She was MUCH stronger going out the second time than the first time. She wanted to stretch her legs and move out. Sooner was starting to get a little tired, and he now has on boots all the way around, and I don’t think he was happy about that. So, he wasn’t moving as quickly as we did the first loop. Miss Daizy was NOT happy about that. At one point, we were behind Kevin and Cindy and as they started pulling away from us, and Miss Daizy was telling me she needed to go faster, she actually started bucking me as I held her back. I’ve been riding this mare for 18 months and she has NEVER bucked me … never even offered to buck me. Okay, I let Miss Daizy work her own speed. She rapidly caught up to Kevin and Cindy without any more incidents. I asked them if it was okay if we tagged along as their stalkers and they were agreeable. (THANK GOD!) I wonder if Miss Daizy remembers riding Bunny Hop last year with Kevin and Czar because she was quite content to work with these guys the whole rest of the second loop. 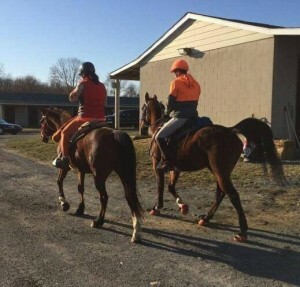 There was one point, while being their ride stalker, that I did have to mention that I felt a bit out of place, them both being in orange and me being in yellow. Kevin made it all better with his comment that I was the next band on the color wheel … chuckle … I was really glad that they were not offended by my jingle bells or the daisy on my helmet. I don’t have any pictures from the second loop as I lost Cheryl and her camera as we pulled out ahead of her and Sooner. I felt really badly to be leaving Cheryl, but I didn’t want to have an explosive horse finishing the ride on her own. Halfway through the second loop, I was heating up and getting sweaty, so at one point we were cantering across a long straight stretch, I managed to get my hoodie off and tie it around my waist. I had cookies in the pocket but figured if I lost them, it was just going to have to be. Now I’m down to my t-shirt. it’s kinda cute, actually – says “Happy Camper” on the front and on the back it says, “Just Get Over it”. And … oh yes … it’s bright yellow. Kevin is a great person to ride with, he takes care of the group and gets us where we need to be on time for the CTR. I had a blast talking to Cindy about her new horse and his change of career paths. I did have a most enjoyable second loop and before I knew it, we were at 2 miles to go. I was very concerned for myself being out of shape for this ride but I was feeling great. No back pain, some left knee pain which I always get due to that knee injuring in 2006, and a little bit of shoulder pain from trying to hold Miss Daizy back at the beginning of the second loop. Other than that, I was feeling wonderfully energized and I was riding light, as if we had only done a 6 mile conditioning ride, not coming to the end of the competition miles. And Miss Daizy? She was still a ton of horse under me. Still light on her feet, still very energized, still “on” and ready to work. 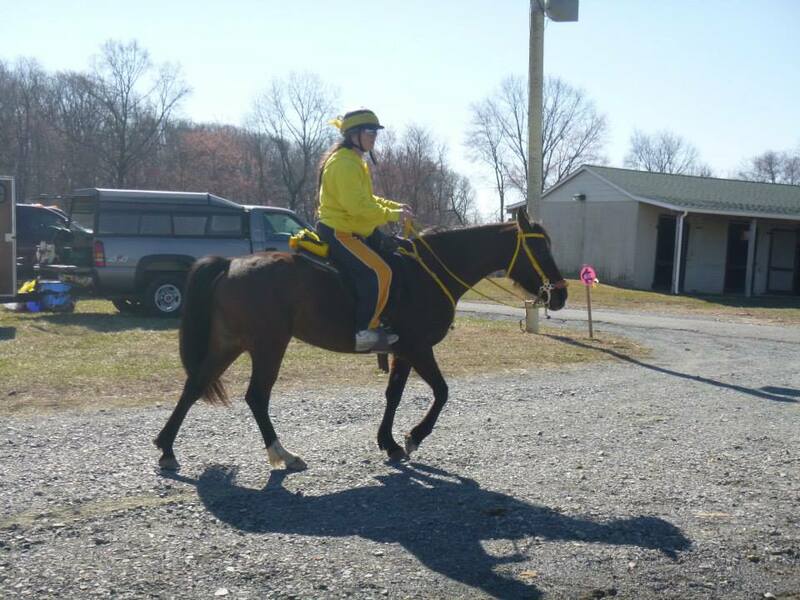 Amazing little bitty horse that she is I was very proud to be her rider coming in to the finish. She barely even sweated the entire ride (I, on the other hand, was soaked to the skin with sweat, I was really hot the second loop out in the sun) I asked Kevin if I could be his stalker when I put her on her first 50 mile ride … and he said “YES!” … OH WOW OH WOW … Kevin will definitely help me get her through her first 50. He told me that she could have probably done a 50 mile ride today … and I agreed with him. She was very willing to keep going when we finished. Last year, she did three two day rides of 50 miles and her riders told me she was much stronger the second day … so I’m going to do a 2 day 50, and then mid to end summer I’m going to put her on a 50 mile endurance ride. I’m very excited. Hopefully I will be in better shape by that time! Believe it or not, Cheryl was not that far behind us. I had barely gotten Miss Daizy’s saddle off when here comes Cheryl and Sooner. Cheryl didn’t know if she was “on time” and I assured her as she passed the trailer she was well within the time frame. I went up at 20 minutes to do my P/R and trot out. Miss Daizy had been eating eating eating the whole 20 minutes we waited so I wasn’t expecting a low heart rate … but she was at 44. She did her trot out like a pro, as she always does. 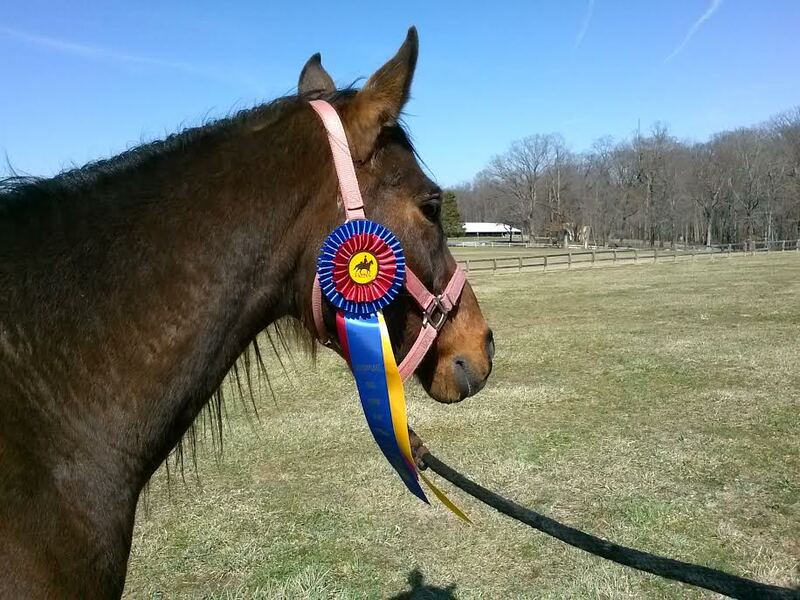 I have to thank Renee (who bred and raised her) for her trot outs. She already knew how to do them when I got her and she has never ever been anything but perfect for trot outs. AND … a little side note here … I did my own trot out at the end. I was a little amazed that my body was holding up so well. Even before I got flipped over by a stupid idiot and was injured, I was never able to successfully do my own trot outs at the end because my knee would usually give out. I was pretty excited by being able to not only ride my own horse, but do my own trot outs. So now we wait for hands on. I am starving to death. I don’t know why because I’ve been eating all morning. Had a bacon sandwich, two bananas, two bottles of water, one bottle of iced tea, one bottle of gaterade, cookies (which did NOT fall out of my pocket, I did get to eat them) some butterscotch candies left over from Linda’s farrier visit (Thank you Amanda) so why am I so hungry. I do not know but I wanted to wait for Cheryl to finish Sooner’s check and then run down for food before the Hands On portion of the competition. Cheryl came back to the trailer with Sooner and she looks near to tears. Apparently they could not get Sooner’s heart rate down. He was hanging at 68. The parameter is 64 minimum to pass and qualify for mileage. She has 30 minutes to get it down. Apparently, everything else was great. His respiration is 5 … 5, can you imagine that? And his trot out was fine, skin pinch and gums were fine. 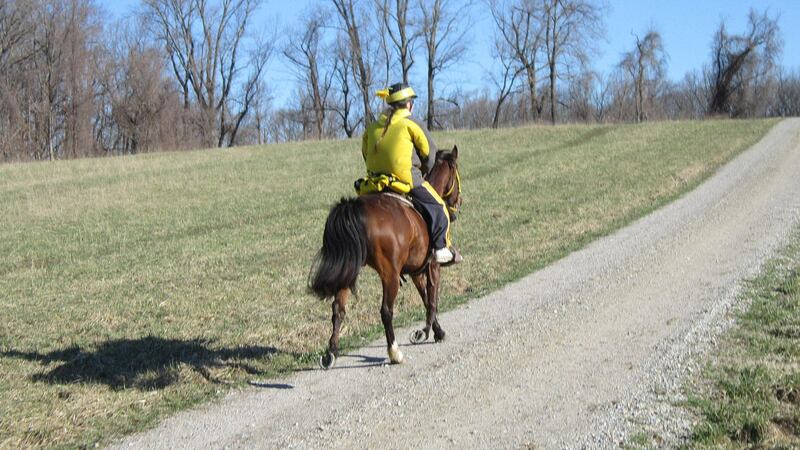 I told her that gaited horses do have a harder time with heart rates, and this was his first long long ride, and he was working with boots on, and traveled on gravel, and did quite a bit of trotting over the terrain … he was probably just sore all over and nothing terrible was going on. She threw a cooler on him to let him eat some food while we ran down to get our own food. I no sooner got down to the food building when I hear them announce me “on deck” for hands on. I hurriedly grabbed food, thanked the ladies helping out with dinner, and ran back up to get Miss Daizy over for hands on. As I’m coming back up, Kevin is hollering for me to get in line. Miss Daizy drank almost her whole bucket of water while I was getting my food, That pleased me because she didn’t drink much while out on trail. I grabbed her and some cookies for her and went to stand in line. She is always so very good for this part. She waits patiently while the lay judge and the vet check her over. She has been like this since day #1 of her competing career and I’m always so pleased with her demeanor. Lay judge checks her over and she has no changes. That surprised me a little bit because I knew I was riding crooked and I’ve been worrying about changing from a treeless saddle to a treed saddle to compensate for my crooked riding style since my back injury. I had checked her out a little bit before going up for hands on and didn’t notice any soreness. The reason I checked her over is because the last five miles of the ride she was happy happy happy on the right diagonal but was cranky cranky cranky on the left diagonal, which meant that I was causing her some stress with my crooked riding. The new girth has solved her girthiness which she lost points for last year. So glad I found this girth because “no change” in her girth area. She also had the biggest feet I’ve ever seen on a little horse, and I think this is the reason she never gets wind puffs. All my other horses used to get windpuffs and lose points. Not Miss Daizy. She travels squarely so doesn’t interfere and get nicks on her pasterns. Another bonus, no change in the legs. Vet checks and lay judge checks sounded to me like there were no changes (whoo hoo) I have no idea what her trot out scores were because I was trotting her out myself and couldn’t hear what they said about it. I knew we were gong to score high, and that excited me. Especially since she and I had a great ride and she was so happy the whole ride. Cheryl and Sooner finally got her heart rate down, within the 30 minute time requirement, so they were going to get their completion for the ride. YAY! Cheryl is very concerned for him, though, and she spent a lot of time talking to Susan (who also competes on Pasos) and finding out how she managed to get her horses to pulse down. Since everything else was good for Sooner, the heart rate issue is something that she will need to work on. We ate our cold food and sat around waiting for the awards. Cate had an emergency so the awards ceremony was a little bit behind schedule while she handled that emergency. I don’t know exactly what it was, just that there was an injury that needed attending to. Sooner with his completion ribbon. AWARDS. This is my favorite part. I love to see how well everyone did at the ride. Cheryl got her completion YAY. The ribbon was very pretty. They move from the bottom up to the top and I was happy when 6th place was given out and I hadn’t been called yet. That meant we were in the top 5 placings. I knew she scored well so we were going to be pretty high. I was sitting on the edge of my chair. Cate changed it up a bit at that point and gave out the specialty awards. Imagine my surprise when Miss Daizy was awarded the High Arabian prize. Really? Competing on an Arabian, in a sport dominated by Arabians, I never ever expected to win THAT award! I was like, “WOW!”. Fifth place – not me. Fourth place – not me. Third place – not me. Huh, maybe I was supposed to get my score sheets when I went up for my Highest Arabian award. Well, that’s okay, I’ll get them after it’s finished. Grand Champion – Dodie and Miss Daizy. I turn to Cheryl and ask her if they just said me. She is grinning from ear to ear. I look up to Cate and see her looking right at me. I’m really glad that I had on my sunglasses because I started crying. I could NOT believe that I just got Grand Champion. I have been competing since 1999 (yes, 15 years) and I have NEVER gotten Reserve or Grand Champion. I am flabbergastered and I am speechless. There’s a first, me speechless. I am still so excited the day after, writing this story. 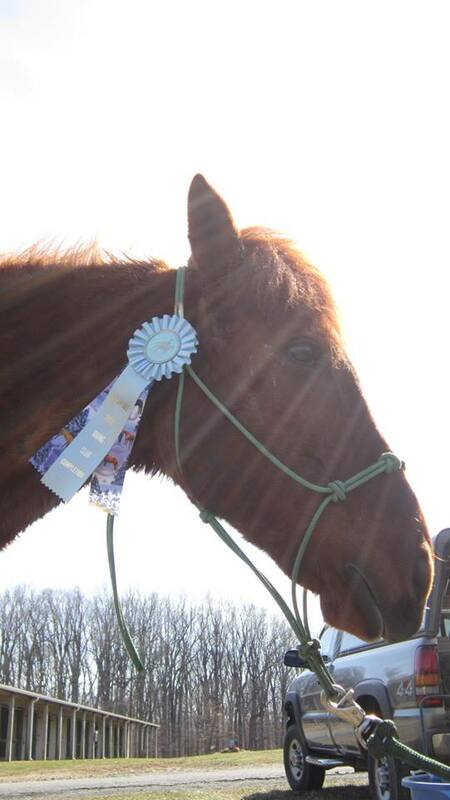 I keep looking at the ribbon and touching it, wondering how I got so lucky to have the best horsie in the universe!